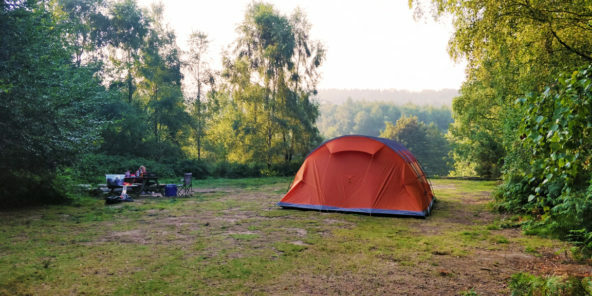 You’ll find The Secret Campsite Lewes in Town Littleworth, a small hamlet in a peaceful part of Sussex, 5 miles north of Lewes. On arrival pop in to reception to see which pitch you will be on and then park up at the unloading area prior to loading up your wheelbarrow. The camping areas are car free but its only a couple of minutes walk to even the furtheset of pitches. Leave Lewes heading north on the A275 ½ mile after the Cooksbridge train crossing, turn right at the Rainbow Inn, signposted to Barcombe. Stay on this road for 2 miles to Holmansbridge Farm Shop after which, we are the fourth turning on the right. The Secret Campsite at Brickyard Farm shares it’s driveway with a house called Woodside and there is a small, low, yellow, sign for The Secret Campsite. Follow the A275 South through North Chailey. Continue through Chailey Green with the Five Bells pub on your right. ¼ mile after leaving Chailey Green, and just after you enter South Chailey take the first turning on the left, Markstakes Lane. Follow this lane for about 1 mile and take the first turning right onto Town Littleworth Road. Follow this road for ½ mile and take a left into Brickyard Farm just after passing White Lodge on your left, where you will see a small low yellow sign for The Secret Campsite. If you reach Holmansbridge Farm Shop you have overshot. From the shop go back up the road and we are the fourth turning on the right. We share our driveway with a house called Woodside. Cooksbridge is the nearest station, just 2 miles away, but there are no trains at the weekend.